One very lucky Bucky Bingo player has just landed themselves a huge £34,115 win with just a 10p ticket! Shell15 from Bradford, Yorkshire landed the UK’s biggest win of its kind from Bucky’s online bingo site when she logged on and visited the ‘Buckingham Room’ for a quick game and then scored this huge prize. The Head of Online Gaming, Matt Welch sent a bottle of bubbly over to Bradford immediately to help Shell15 celebrate her win. Every day Bucky Bingo gives it’s members the chance to play bingo for free but with real cash prizes and between 11am and Midday and 11pm and midnight there’ll be free bingo games in the Free Room, so that’s 2 hours a day of free bingo with the exception of Friday when the free games start at 6pm and go on until Midnight making Friday a 7 hour free bingo fest! There are some great monthly promotions on this February with 10 Chocoholic hampers worth £50 each from Thornton’s to be won. If you love your truffles, milk chocolate, dark chocolate and all things sweet you’ll want to get in on the action so just enter 1LOVEBUCKY2 and stake £15 on bingo anytime in February and you’ll be entered into the prize draw, easy! Valentine’s Day needn’t be a big disappointment if you’re stuck at home alone as the Valentine’s Bingo Linx offers a massive £14,000 prize and that’s in addition to the normal Linx game worth £10,000 which pays on the last Sunday of every month! They really are feeling generous at Bucky this month. Every Wednesday one lucky player who plays bingo between 6pm and 11pm will be chosen at random to receive a £100 cash prize. Five runners up will be awarded £10 each so there’s a midweek promo to get you going! Thursdays come around and the weekend is nearing and to celebrate Bucky are giving away 5 bottles of top notch bubbly every week. This offer is called Thirsty Thursdays and all you need to do to get close to the good stuff is buy a bingo ticket between 6pm and Midnight on a Thursday and you will instantly be entered into the draw. Weekends are our favourite time of the week and with good reason as Bucky Bingo give away cash prizes from £10 to £1000, there’s no strings just buy a bingo ticket on either Saturday or Sunday and you could soon receive a random cash prize! Every month Bucky also giveaway £1000 to players in their free draw all you need to do to get your mitts on some cash is deposit and play bingo during the current month to enter that month’s draw, simple! First place will take home £250, ten runners up will get £25 and another 50 players will win £10 each! 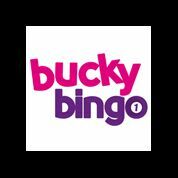 There’s so much on at Bucky Bingo right now, there’s sure to be a promotion that takes your fancy so if it’s free bingo or big cash prizes you’re after there’s something on this site for you there’s even some good old fashioned penny bingo and the odd BOGOF, what more could you want? !